As summer turns to fall, many types of berries begin to disappear from grocery store produce departments. Don’t be so disappointed by the departure of strawberries and raspberries that you miss the arrival of another fresh berry. 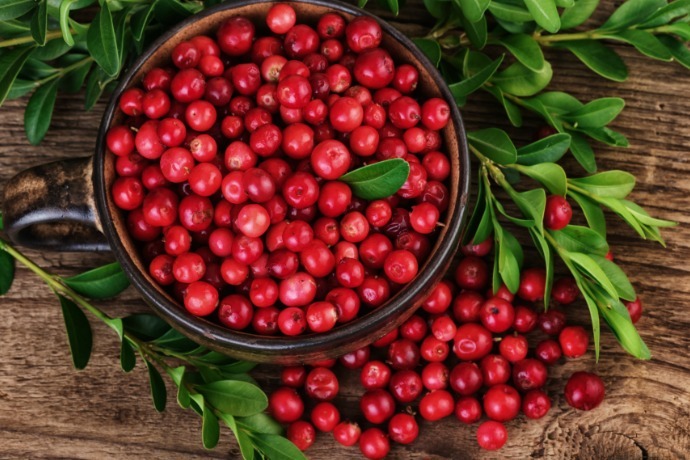 Cranberries are in season for a short time, from September to December, but you can enjoy them all year long if you act quickly. Plus, their tart taste makes them delicious in both sweet and savory recipes. This low-sugar, high-fiber fruit is best in its natural state. On your next shopping trip, we hope you’ll grab a bag or two of fresh cranberries. In fact, after reading this post, we bet you’ll add them to your list for Thanksgiving. Most cranberries are harvested by flooding the bogs where they grow and agitating the water. The berries come off the vines and float to the surface of the water, where they are collected. However, cranberries that are intended to be sold fresh are dry harvested. Dry harvesting actually requires that the cranberry vines be completely dry; not even dew or frost can be present. Fresh cranberries start to appear in stores in September, and they’ll be gone by the time the holidays are over. But the good news is they will keep for a month or more in the refrigerator, and for an entire year in the freezer. Either way, store them in their original packaging (there’s no need to transfer them to a freezer bag or plastic container), and don’t wash them until you’re ready to use them. For planning purposes, each 12-ounce bag contains three cups of whole fresh cranberries. There’s also no need to defrost frozen cranberries; use them as-is. Pulse fresh or frozen cranberries in your food processor to chop them roughly before adding to a recipe. If you cook them whole on the stovetop, they’re done when the berries pop. Don’t leave them to simmer, or they will get bitter. Cranberries complement cheese beautifully, so keep this recipe from The Wicked Noodle in mind as an appetizer for your next gathering. Not only is it elegant and delicious, it’s also surprisingly fast and easy. Mix the cranberries with balsamic vinegar and sugar, and spread them on a sheet pan to roast. You could also add them to a saute pan on the stovetop while the brie bakes in the oven. Either way, top the baked brie with the balsamic cranberries, and serve with bread or crackers. This appetizer could be a festive addition to a fall gathering, or a good way to whet the appetites of your Thanksgiving guests for cranberry sauce at the main meal. A good vinaigrette recipe is always a better bet than bottled dressing, and this one from Cook Nourish Bliss is a snap to whip up. Soften some fresh cranberries on the stovetop with fresh orange juice. Then blend with white wine vinegar, Dijon mustard, seasonings, and olive oil. We love recipes like this because they’re a great way to use up a little of something you don’t want to toss. While this recipe only calls for one-third cup of cranberries, they pack a lot of flavor. Plus, it’s never a bad idea to put together a nutritious salad with tasty homemade dressing, especially on Thanksgiving. We’ve never tried adding cranberries to cornbread before, and now we’re wondering where this brilliant idea has been hiding. What a perfect dish for Thanksgiving! This recipe from NYT Cooking deserves a spot in our holiday menu planning, and perhaps in yours too. We’ll admit it sounds tiresome to cut all those cranberries in half, but that’s how they absorb the confectioners’ sugar to mellow their tartness. If you have a favorite cornbread recipe already, you could probably fold the sweetened cranberries into it. Otherwise, follow the steps in this one and enjoy the flavor combination. You could even make it ahead and use this cornbread in your stuffing. We can’t decide if this recipe from Home. Made. Interest. ought to be a side dish or a dessert. Perhaps it can do double duty. Either way, we think it ought to be invited to Thanksgiving. After all, sweet potatoes are a regular guest. The tart cranberries help balance the sweetness of the potatoes, brown sugar, and marshmallows. The pecans and pomegranate arils add texture too. You can leave the marshmallows out if they aren’t a fixture at your Thanksgiving meal. If you’re not ready to get adventurous with fresh cranberries, at least indulge us in this recipe from Food & Wine for cranberry sauce. We’re confident it will beat the gelatinous canned cranberry sauce that’s been a standby for too long. This sauce features ruby port wine, orange zest, and orange juice, along with a bag of cranberries and a scoop of sugar. We hope it will have a place at your Thanksgiving table.